Coir-based soil-less growing media, ideal for use with drain-to-waste hydroponic gardening. Ideal for experienced and/or adventurous hydro growers. This inert mix provides a clean slate for you to add the nutrients your specific plant needs to thrive. You’ll still want to add Root Farm liquid nutrients at the time of planting to build your plant’s best possible environment. Designed by hydroponics experts to optimize aeration and water retention needed for a successful hydro garden. When used with Root Farm Base Nutrient (Part 1) and a Supplemental Nutrient (Part 2), you have the tools you need to harvest farm-fresh provisions 12 months a year. Get ready for an unseasonably good yield. TO PLANT: Choose a Root Farm Felt Pot that is the right size for your transplant or seedling started in the Root Farm Seed Starting Kit. Fill felt pot with Root Farm Hydro Garden Coco Coir Blend until nearly full. Remove transplant from container and place into your felt pot. Finish filling with Coco Coir Blend until level with the top of the root ball and press lightly to secure your plant. Water thoroughly. 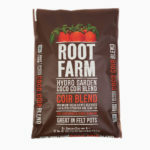 TO WATER: Check one inch below the surface of Root Farm Hydro Garden Coco Coir Blend. If it is lighter in color and nearly dry to the touch, add water. 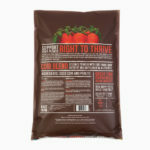 TO FEED: This product is designed to be used with Root Farm Base Nutrient (Part 1) and a Supplemental Nutrient (Part 2). Nourish your plants with Root Farm Base Nutrient plus the right supplement for your chosen plant type.